The Global Energy and Exchanges Process Evaluation Studies (GEWEX PROES) intend to provide observational based metrics for a better understanding of climate related physical processes and thus to advance their representation in research, weather and climate models. Convection is a fundamental mode of mixing and transport, moving heat, moisture, momentum, and atmospheric constituents through the Earth’s atmosphere. Convective storms are the sole source of precipitation in many regions of our planet. UT clouds, formed as outflow of convection, play a vital role in the Earth’s weather and climate system by modulating the Earth’s energy budget and UT heat transport. The GEWEX UTCC PROES working group aims to gain a better understanding of the interconnection between the convection and the properties of the outflowing anvils. The focus will be widened to the role of cirrus originating from in situ freezing driven by large-scale forcing, via a link to SPARC. Large-scale modelling is necessary to identify the most influential feedback mechanisms. The WG links communities from observations, radiative transfer and transport modelling, as well as small scale process and climate modelling. 3 meetings since 2015 led to first cooperations. 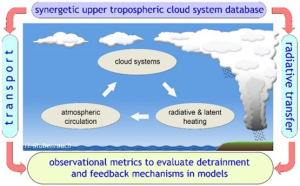 UTCC PROES aims to develop new diagnostic methods using existing observations in order to examine the processes that detrain UT clouds from convection and the interconnection between convection and the anvil radiative heating, which affects the large-scale atmospheric circulation. This heating will be affected by at least 3 factors: areal coverage, horizontal emissitivity structure and vertical structure of the UTC systems. Existing data bases from the Tropical Rain Measurement Mission (TRMM), Megha-Tropiques and the International Satellite Cloud Climatology Project (in particular statistics on weather states) have been extensively used to study tropical mesoscale convective systems (see references). UTCC PROES introduces a new data base of UT cloud systems (Protopapadaki et al. 2017), based on cloud properties from IR sounders (AIRS and IASI): It provides the horizontal emissivity structure within these systems and is being complemented by CloudSat-CALIPSO radar-lidar track vertical information, thermodynamic and dynamic information from meteorological reanalyses, and information on the life cycle stage from TRMM radar and geostationary imagers.